The entrance to Hagia Sophia from the south entrance is through a bronze gate to the vestibule with a doorway to the narthex. The mosaic is in the tympanum over the doorway and is dating back to 944. Virgin Mary is sitting on a backless throne decorated with jewels. Child Christ is sitting on her lap and he is holding a scroll. 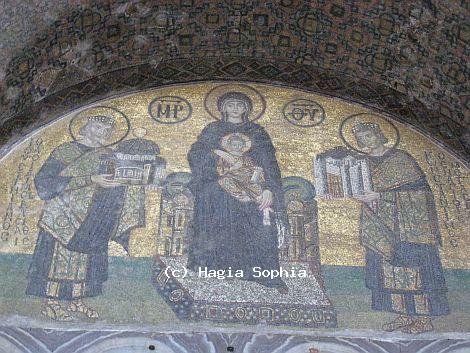 They are both flanked on the left by Justinian I, and on the right by Constantine the Great. Both emperors are in their Byzantine ceremonial dress. Emperor Justinian is offering a model of Hagia Sophia to Virgin Mary, and Emperor Constantine is offering a model of the city, the city that he had made his imperial’s capital giving his name after it. The mosaic presents the connection between the church and the empire and the church as the seat of imperial ritual.